It makes the project completely autonomous but the downside is indeed a large file size. The decision to have everything embedded in the project file comes from the fact that everything is non destructive. It means that the projects “rebuilds” itself when you open it. If a single brush or material is missing from your shelf, the project will break and will not be able to correctly regenerate. The high-poly meshes are not included in the project. They are just linked to the project. ・Use the “clean” then “save” function in the file Menu to get rid of unused resources. ・Do a “Save As” from times to times to also get rid of additional unused data. ・Set your texture set to a low resolution, like 512, to reduce the disk footprint of the cached textures used for the visualization of the texture sets. 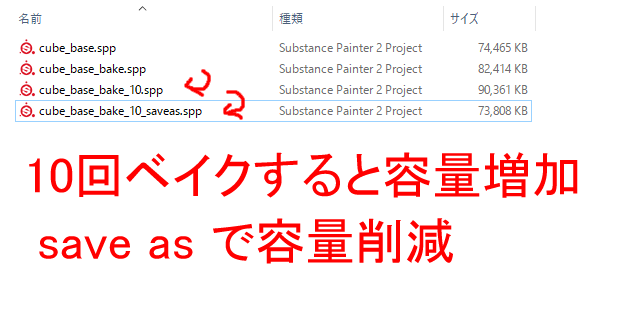 On Windows, the project file is protected from read/write access, therefore the size in the Windows Explorer can be incorrect until you close the project in Substance Painter.